In a daring show in 1969 the Morsbroich Museum presented the first edition of German Conceptual Art. Forty-six years later the new edition of Conceptual Art at the Leverkusen Museum traces the artistic strategies of this artistic movement. For one month in the autumn of 1969 the baroque hunting lodge Morsbroich was the scene of a new art trend, which broke radically with the traditional idea of art. The Leverkusen exhibition Konzeption Conception was one of the world’s first of this movement and at the same time its first museum show in Germany. Availing himself of a selection made by the gallery owner Konrad Fischer, the then museum director Rolf Wedewer presented works by over forty artists, who instead of supplying finished, visible works of art showed only sketches, drafts, descriptions, photographs, photocopies, notes or even letters. This challenging, predominantly paper show naturally met largely with incomprehension and opposition. The open form of the works demanded the viewer’s own active thinking. Among the artists exhibited then, who now are counted among the classics, were the guiding figure and name-giver Sol LeWitt, Robert Barry but also Gilbert & George and the German artists Bernd und Hilla Becher, Hanne Darboven, Sigmar Polke and Timm Ulrichs. The hunting lodge was surveyed, described, covered with notes and sometimes challenged with socially critical actions. Conceptual Art cares less about visual perception than about envisioning issues relevant to the time and philosophical reflections. Moreover, in it art-immanent questions assume an important place. Pivotal is the concept, which need not be necessarily realized. Thus Conceptual Art also put to one side the significance of the original and demystified it. The works of the European contingent are less abstract and theoretically consistent than those of the American pioneer. They make their escape from traditional art somewhat clearer. For example, Ulrichs gives his sometimes tautologous views sculptural form, Darboven spreads out her cultural-historical themes in space-filling diary notes enriched with objects, and Polke finally spearheads a critically experimental direction in art. 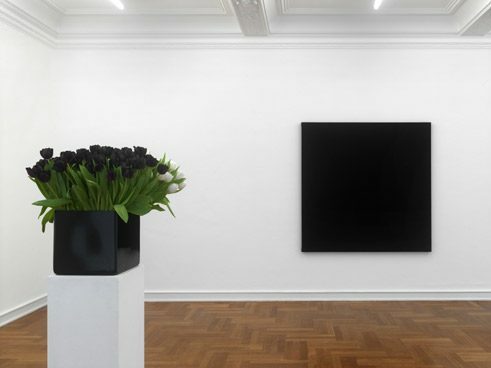 The mere listing of names and the corresponding works, however, shows how broad is the artistic spectrum and how much conceptual art is intertwined with Minimalist Art, from which it ultimately emerged, as did contemporaneous trends such as Land Art, Anti-Form, Process and Context Art. In 2015 the Schloss Morsbroich Museum is showing that Conceptual Art of the 1960’s has had a momentous and inspiring effect on the next generation. The contributions of the twenty exhibited artists are by no means dry but brimming with sensuous charisma. Depth and levity unite in powerful images. To the radical dematerialization of the first generation, the second responds with vivid visualizations of contemporary issues. Willem de Rooij, Bouquet VI (2010), “more Konzeption Conception now”, Museum Morsbroich | Photo: Achim Kukulies Even if all art should be conceptual, the generation of post-Conceptual artists stands out because the conceptual approach is defining of their work. This may be seen, in accordance with the extended medial possibilities, in the most varied form – for example, in close-to-the-audience performances (Studio for Propositional Cinema) and demonstrative videos (Christian Falsnaes). The conceptual approach is also evident in the referential character of a work. The absent, negation and emptiness still play a role, but the new generation not only names them but also makes them tangible. For instance, in a socially critical series of photographs, Sven Johne asks after the authentic in abandoned places in eastern Germany where a circus dismantled its tent. The majority of artists today make reference to local, social, political and even ethnic problems. Their language is less theoretical than illustrative or poetic: the fine colored drawings of Jorinde Voigt, based on texts by the social theorist Niklas Luhmann, can be read like musical scores. In Silent Talk (2012) Juergen Staack makes the very existence of language his theme when in a performance he disconcertingly mediates in time lag between deaf people and exhibition visitors. In Title Variable Ceal Floyer, using an elastic band that is stretched over the walls, takes the idea of the measurement of space, once pioneered by Mel Bochner, to absurdity. Here too an essential aspect of post-Conceptual Art comes to light: the humorous treatment of ideas and materials and self-irony and skepticism toward all doctrines. Therein also lies the contradictory nature of the content and the difficulty of clearly interpreting these works. If that isn’t an indication of the durability of Conceptual Art. A two-volume catalogue, more Konzeption Conception now (2015), edited by Stefanie Kreuzer, accompanies the exhibition. The first volume consists of a facsimile reprint of the out-of-print catalogue Konzeption Conception from 1969. The second volume documents not only the 2015 exhibition but also contains unpublished documents from the 1969 exhibition. Both catalogues are also available as “artist’s books”, in which each artist has designed his or her page. Renate Puvogel works as an art critic in Aachen.